Here are some of the wonderful comments we have received from parents whose children have been enrolled into the Beads of Courage programme. Be Child Cancer Aware is privileged to be working with Beads of Courage in America to bring this programme to our UK hospitals. R.FOXTON, SURREY. 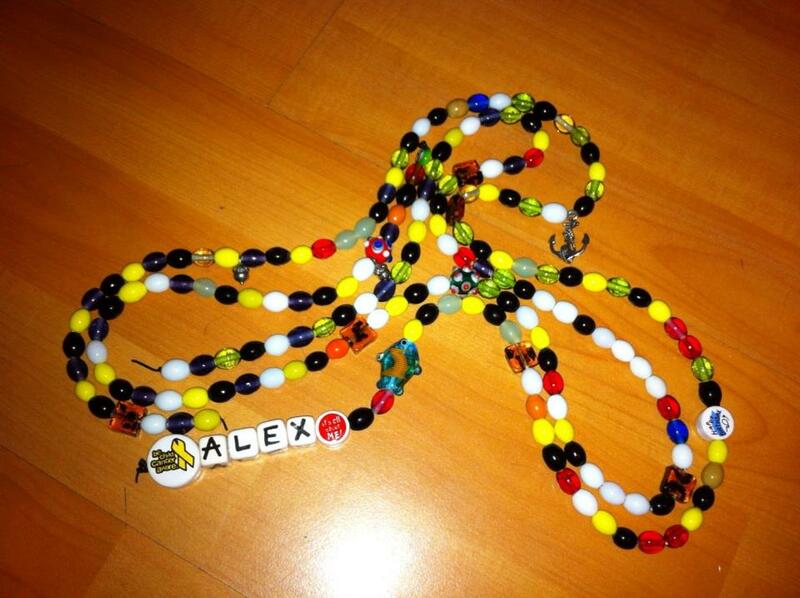 The beads are an awesome idea. A lovely record of the horrendous treatment journey. Thank you! B.ROBSON, LEICESTERSHIRE. These beads have helped me get through some big days. I love making different things with them. D.EVANS, LEICESTERSHIRE. Such a lovely idea! B.LA ROSA, LEICESTERSHIRE. My husband and I think this a fabulous way for our daughter to follow her journey and to have something to look back on! Thank you. R.HARDYMAN, BERKSHIRE. What a fantastic thing, our son is 2 and has been ill for nearly a year. He has 600 beads and spends hours threading them. After every poke, test or drug he asks for a bead. Thank you! F.TUKE, LONDON. So far this has made a huge difference to my daughter, as for 18 months she has struggled with all the different procedures. If only we had had them before!! N.WARNOCK, KENT. Our Daughter adores the beads; she looks forward to hospital visits now. Thank you so much! S.DENYER, NORTHAMPTON. This is such a brilliant idea! My son is very proud of his string of beads so far. Thank you! S.FRANKLIN, ESSEX. Such a wonderful idea. Love it! G.BRADSHAW, LINCONSHIRE. Great idea, my son is very excited to be part of Beads of Courage. It has made hospital visits a little more fun! R.SHAND, BERKSHIRE. Thank you, our daughter loves her beads! K.TOUHEY, SHEFFIELD. What a wonderful idea. Thank you so much! L.HARRISON, NORTHAMPTON. Beads of courage are such a beautiful way of representing the numerous procedures/treatments etc; allowing young patients and loved ones to “see” their journey through their illness. Thank you! S.SAVAGE, LONDON. I think it is a lovely idea! C.BROWN, KENT. A great visual representation of a child’s medical journey! P.SALVI, E.SUSSEX. What a fantastic way to show others the journey they are enduring. We love Beads of Courage. A.SANGSTER, STRATFORDSHIRE. Thank you, the children love it. My son is so proud of his Beads of courage. Inspirational! Z.WRIGHT, READING. We received the beads for the first time today. My daughter thinks the beads are fantastic!